I’ve always known that Norton is a smart toddler. He’s got the mind of a little engineer; he has to figure out how everything works. Of course, having a smart toddler means that child proof locks aren’t always effective, but that’s just how things work. There’s one area of Norton’s education that I’d been seriously neglecting. I hadn’t bothered with putting much attention on teaching him his letters and numbers. I was too busy worrying about Norton’s toddler language delay. While I was busy worrying and focusing on other things, Norton was busy learning. You see, before Christmas, the husband and I were shopping in Zeller’s. I was trying to figure out what I wanted to get Norton for Christmas, do some pricing, figure out our game plan…. You know, the usual things that a Christmas-crazed mom on a budget would do. Norton was getting bored, but he wasn’t being obnoxious yet. The husband spotted a bus on the shelf and handed it to Norton to keep him entertained. Norton playing with his bus. The bus played some little introduction music that Norton adored. We bought it for him that night and gave it to him to play with. Whatever, it was only ten bucks or something. Not a terribly expensive toy in the grand scheme of things, anyway. 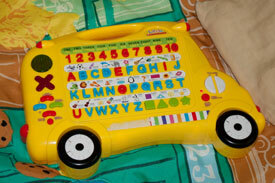 Sure, the bus had alphabet games on it, and it was bilingual. But he had no idea about the alphabet, and was really a little young for the toy. He was around twenty months at the time. The toy was rated around two and up, though, so we decided that it was close enough. Even if he didn’t get anything out of it, at least it was keeping him entertained. Over the last few months, we’ve been hearing Norton up past bedtime. He was often playing with the bus. We never thought much of it; he was in his room and he was quiet. It’s not like we could force him to go to sleep. Whatever; he always went to sleep eventually when he was tired, and woke up when he was ready to wake up. Then one morning, the husband made a discovery when he went to change Norton’s diaper before liberating him from his room. Norton was playing with the bus. 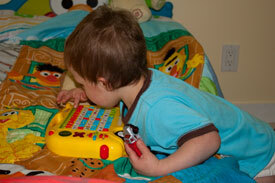 The toy was asking him, in French, to find certain letters. Norton got nine in a row. That was far too many to be a fluke. Then Norton did it in English. We were amazed. Norton had managed to teach himself the alphabet, his numbers, and shapes in both French and English. While writing this blog post, I looked high and low online to see if I could find a place to purchase this bus. It’s called the Little Scholastic Bilingual Alphabet and Number Bus. Apparently, it was available in Spanish and English in the States and French and English in Canada. The only place that I could find it for sale still was on eBay. As for me, I’m still amazed that my boy managed to teach himself letters, numbers, and shapes in two languages from playing with a toy. I mean, I knew that I had a smart toddler on my hands, but wow. Has your child ever surprised you with what he’s taught himself?